For other uses, see Rhine-Ruhr (disambiguation). The Rhine-Ruhr metropolitan region (German: Metropolregion Rhein-Ruhr) is the largest metropolitan region in Germany with over 10 million inhabitants. It is of polycentric nature. It covers an area of 7,268 square kilometres (2,806 sq mi) and lies entirely within the federal state of North Rhine-Westphalia. The Rhine-Ruhr metropolitan region spreads from Dortmund-Bochum-Essen-Duisburg (Ruhr Area) in the north, to the urban areas of the cities of Mönchengladbach, Düsseldorf (the state capital), Wuppertal, Leverkusen, Cologne (the region's largest and Germany's fourth largest city), and Bonn in the south. The location of the Rhine-Ruhr at the heart of the European blue banana makes it well connected to other major European cities and metropolitan areas like the Randstad, the Flemish Diamond and the Frankfurt Rhine Main Region. The metropolitan area is named after the Rhine and Ruhr rivers, which are the region's defining geographical features and historically its economic backbone. The largest cities in the Rhine-Ruhr area are Cologne, with over 1 million inhabitants, followed by Düsseldorf, Dortmund and Essen, which each have a population of over 500,000. There are many different sub-definitions of what belongs to the Rhine-Ruhr area, but the metropolitan area itself has officially defined borders with Hamm in the east, Mönchengladbach in the west and Bonn in the south and the small city Wesel as its northernmost point. The northern border is similar to the border of the Ruhr Area. The table below shows an unofficial summary of regions. In the official definition the metropolitan area is much smaller. Eurostat's Urban Audit splits the Rhine-Ruhr region into six Larger Urban Zones (LUZ). 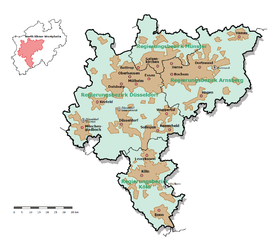 These six Urban Zones do not cover the cities of Remscheid and Solingen nor the district of Rhein-Kreis Neuss. Historically, most of the Ruhr area was for the most part characterized by heavy industry since the age of industrialisation in the late 19th and early 20th century. Since the Middle Ages, Cologne, Dortmund and other cities were important regional trading cities, but during the 19th century the city of Düsseldorf grew to become the administrative center of the region and since 1945 its political capital. Today, the Rhine-Ruhr metropolitan region accounts for roughly 15% of the GDP of the German economy, which would place it as the 4th largest GDP of metropolitan area in the European Union and the 16th largest GDP in the world. Despite this size, the Rhine-Ruhr region as a whole often lacks international competitiveness because it lacks a unified presentation. Cities and urban areas within it often pursue separate investment policies against each other. From within, Düsseldorf, Essen and Cologne are by far the largest economic centers, with specialisation in financial/high tech and insurance/multi media services respectively. Other major economic centers are Bonn and Dortmund. The region is home to twelve Fortune Global 500 companies, among them E.ON AG, Essen, Deutsche Post AG, Bonn, Metro AG, Düsseldorf, Deutsche Telekom AG, Bonn, ThyssenKrupp AG, Essen/Duisburg, RWE AG, Essen, Bayer AG, Leverkusen, Franz Haniel & Cie. GmbH, Duisburg, Evonik Industries, Essen, Hochtief AG, Essen and the Henkel Group, Düsseldorf. The Rhine-Ruhr area's climate is characterized by having the warmest winters in Germany, especially its western part at the Lower Rhine area. Classified by Köppen-Geiger climate classification to be oceanic (Cfb). The area has four international commercial airports, and multiple smaller aerodromes for general aviation. North Rhine-Westphalia has the densest network of Autobahns in Germany. The rail, S-Bahn, U-Bahn and bus companies are administered through a consortium of local and regional transport lines, the Verkehrsverbund Rhein-Ruhr. It offers a rapid transit system which interconnects all cities and their respective local buses, trams, U- and S-Bahn systems, partly under the umbrella of Deutsche Bahn. Their systems are highly integrated where even some subway lines continue from one city to the next (for example between Düsseldorf and Duisburg or Bochum and Herne, which is unique in Germany, as the city border is crossed underground). The region is divided into several urban zones and fares are paid according to the amount of urban areas (or zones) passed through. Tickets include door to door transportation with all forms covered in one ticket with the exception of high speed rail (which only stops in the major cities). Some excursions, theatre and opera tickets as well as museums offer free transportation from any point in the Rhine Ruhr area to the venue and return. Duisburg Inner Harbour (Duisport) and Dortmund Port are large industrial inland ports and serve as hubs along the Rhine and the German inland water transport system. The region is host to numerous large events, comprising fun fairs and cultural events like the Cologne and Düsseldorf carnivals (carnival is however a public event in almost all cities and towns of the area), the Cologne Comedy Festival, Ruhrfestspiele Recklinghausen, and the RuhrTriennale, as well as gamescom and other trade fairs at koelnmesse—Cologne Trade Fair and Messe Düsseldorf; and Essen Motor Show in Essen. With a capacity of up to 20,000 people, the Lanxess Arena and Westfalenhallen are amongst the largest indoor arenas in Germany. The region is home to a total of 13 Bundesliga football clubs, of which five are active in the season of 2017–18. The most successful among them are Borussia Dortmund, Borussia Mönchengladbach, 1. FC Köln, FC Schalke 04 and Bayer 04 Leverkusen. Signal Iduna Park, the stadium of Borussia Dortmund, is the biggest stadium in Germany. The area has planned to bid for 2032 Summer Olympics. Several tourist destinations within the region attract over 12 million tourists per year. Cologne Cathedral, Augustusburg and Falkenlust Palaces at Brühl and the Zollverein Coal Mine Industrial Complex at Essen are UNESCO World Heritage Sites. Other sights include Schloss Benrath in Düsseldorf and several anchor points of the European Route of Industrial Heritage. NRW Forum, Kunstsammlung Nordrhein-Westfalen, Kunsthalle Düsseldorf, Museum Koenig, Museum Ludwig, Romano-Germanic Museum, Wallraf-Richartz Museum, Neanderthal Museum, Museum Folkwang, Museum Ostwall, Lehmbruck Museum, German Mining Museum and Deutsches Museum Bonn are some of the most famous examples. This map of the Rhine-Ruhr Area spans approximately 130 kilometers (81 mi) from north to south. The following register lists all municipalities that officially belong to Rhine-Ruhr area. Demographically, these municipalities include 20 cities (German: Kreisfreie Städte), each with more than 100,000 inhabitants, and 11 districts (German: Kreis), each with a population of more than 250,000 inhabitants. Some districts only belong partly to Rhine-Ruhr area. In such a case only the municipalities that belong to the metro area are listed. ^ Öffentlichkeitsarbeit", IT.NRW - Zentralbereich 14 "Marketing und. "Information und Technik Nordrhein-Westfalen (IT.NRW) - Bevölkerungszahlen auf Basis des Zensus vom 9. Mai 2011". www.it.nrw.de (in German). Archived from the original on 2016-07-14. Retrieved 2018-03-25. ^ "metropoleruhr.de - Metropole Ruhr - Portal für das Ruhrgebiet". Metropleruhr.de. Retrieved 16 October 2014. ^ "Home: Region Köln Bonn". Region-koeln-bonn.de. Retrieved 16 October 2014. ^ "Essen - Städtestatistik im Internet". Staedtestatistik.de. Retrieved 16 October 2014. ^ "Düsseldorf, LH - Städtestatistik im Internet". Staedtestatistik.de. Retrieved 16 October 2014. ^ "Mönchengladbach - Städtestatistik im Internet". Staedtestatistik.de. Retrieved 16 October 2014. ^ "Wuppertal - Städtestatistik im Internet". Staedtestatistik.de. Retrieved 16 October 2014. ^ "Köln - Städtestatistik im Internet". Staedtestatistik.de. Retrieved 16 October 2014. ^ "Bonn - Städtestatistik im Internet". Staedtestatistik.de. Retrieved 16 October 2014. ^ "Comparative Analysis of the Rhine-Ruhr Metropolitan Region" (PDF). Düsseldorf Regional Government. August 2002. Retrieved 16 October 2014. ^ "Metropolitane Funktionen der Städte in der Metropolregion : Rhein-Ruhr" (PDF). Raumplanung.uni-dortmund.de. Archived from the original (PDF) on 11 July 2007. Retrieved 16 October 2014. ^ "Please create a screen name to access this feature". CNN. Money.cnn.com. Retrieved 16 October 2014. ^ "Temperature, Climate graph, Climate table for Düsseldorf". Climate-Data.org. Retrieved 16 September 2017. ^ "Temperature, Climate graph, Climate table for Essen". Climate-Data.org. Retrieved 16 September 2017. ^ "Temperature, Climate graph, Climate table for Cologne". Climate-Data.org. Retrieved 16 September 2017. ^ "Temperature, Climate graph, Climate table for Dortmund". Climate-Data.org. Retrieved 16 September 2017. ^ a b c d e "Amtliche Bevölkerungszahlen von Information und Statistik Nordrhein-Westfalen (German)". It.nrw.de. Archived from the original on 28 September 2011. Retrieved 16 October 2014. Knapp, Wolfgang (1998). The Rhine-Ruhr area in transformation: Towards a European metropolitan region?. European Planning Studies. Dieleman, Frans M. (1998). Randstad, Rhine-Ruhr and Flemish diamond as one polynucleated macro-region?. Blackwell Publishing. Blotevogel, Hans H. (1998). The Rhine-Ruhr metropolitan region: Reality and discourse. European Planning Studies. Wikimedia Commons has media related to Rhein-Ruhr.